If you don’t want to be depressed, you should stop reading right now. You probably know that we’ve been suffering because of a rising burden of government spending. And you probably understand that much of the problem is the relentless growth of redistribution and transfer programs. But you probably don’t realize how far America has traveled in the wrong direction. In today’s Wall Street Journal, Nicholas Eberstadt of the American Enterprise Institute rips apart President Obama’s empty assertion that the welfare state is desirable. …the president is tired of listening to critics of America’s entitlement programs, and as far as he is concerned, the discussion is now over. It is not over—and won’t be anytime soon, because the country’s social-welfare spending is generating severe and mounting hazards for the nation. These hazards are not only fiscal but moral. Eberstadt shares a bunch of bullet points that should worry anybody who cares about the future of the nation, starting with an inverse version of Mitchell’s Golden Rule. Handouts have been growing twice as fast as overall personal income! • Over the 50-plus years since 1960, according to the Bureau of Economic Analysis, entitlement transfers—government payments of cash, goods and services to citizens—have been growing twice as fast as overall personal income. Government transfers now account for nearly 18% of all personal income in America—up from 6% in 1960. • According to the BEA, America’s myriad social-welfare programs (the federal bureaucracy apparently cannot determine exactly how many of these there are) currently dispense entitlement benefits of more than $2.3 trillion annually. Since those entitlements must be paid for—either through taxes or borrowing—the burden of entitlement spending now amounts to over $7,400 per American man, woman and child. The $7400 figure for per-capita redistribution burden is astounding. Others have calculated that this is akin to $60,000 for every poor household. And even though I’ve written about the 49 percent figure, I had no idea that such a small portion was due to the aging population. • According to the latest data from the U.S. Census Bureau, nearly half (49%) of Americans today live in homes receiving one or more government transfer benefits. That percentage is up almost 20 points from the early 1980s. And contrary to what the Obama White House team suggested during the election campaign, this leap is not due to the aging of the population. In fact, only about one-tenth of the increase is due to upticks in old-age pensions and health-care programs for seniors. A big problem is that many working-age people have decided not to work. • As entitlement outlays have risen, there has been flight of men from the work force. According to the Bureau of Labor Statistics, the proportion of adult men 20 and older working or seeking work dropped by 13 percentage points between 1948 and 2008. …In December 2012, more than 8.8 million working-age men and women took such disability payments from the government—nearly three times as many as in December 1990. For every 17 people in the labor force, there is now one recipient of Social Security disability program payments. The solution, of course, is entitlement reform. But that’s just part of the answer. We also need to change the culture. If people decide it is okay to live off the government, even leftists have begun to admit that it is very hard to re-create a system of self reliance. 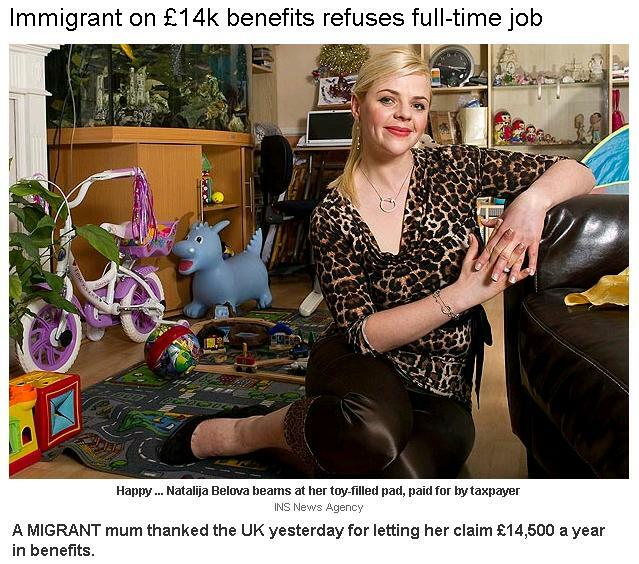 The welfare state creates some amazingly pathetic and disgusting individuals. But I’ve never found a match for Olga, a Greek woman who thinks it is government’s job to take care of her from cradle to grave. At least not until now. I’m excited to announce that Olga has a soulmate named Natalija. She’s from Lithuania, but she now lives in England, and she doubtlessly will inspire Olga on how to live off the state. Here’s some of what The Sun reported about this very successful moocher. And what is given to her? Quite a lot. The graduate, who became a single mum after she arrived here, rakes in more than £1,000 a month in handouts — £14,508 a year — to fund her love of designer clothes, jaunts to the Spanish sun and nightclubbing. She bragged: “I have a lovely, fully-furnished flat and money to live properly on. …Her handouts total £279 a week — with housing benefit contributing £183, child tax credit adding £56, child benefit £20 and her council tax being paid to the tune of £20. You might expect Natalija to be grateful, but you’d be wrong. I’ve written about the benefits of tax competition between nations. Well, this story shows the perverse impact of welfare competition between countries. We also have a remarkable example of labor supply economics. 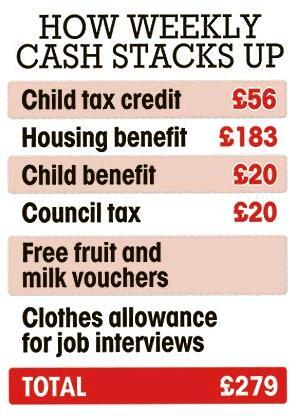 This is the real-world example of these charts showing how the British welfare state destroys incentives. By the way, here’s a chart showing the same destructive policies in the United States. Let’s look at one last excerpt about Natalija. British taxpayers can take comfort in the fact that this human tick is living a nice life. Her self esteem has been boosted? Oh, joy! And I can just imagine how much self esteem her daughter will have after growing up with a moocher for a mother. John Hinderaker of Powerline was first on this horrific story and his analysis is very much worth reading as well. But since imitation is the sincerest form of flattery, I figured I would share the story and add some of my thoughts. By the way, if you want more than just horrifying anecdotes, click here for a video that looks at the dismal impact of the American welfare state and click here to see how Obama has exacerbated the negative effects of such policies in America.